Chennai: Indian Institute of Technology Madras has launched a ‘Winter Course on Machine Intelligence and Brain Research’ at its Center for Computational Brain Research (CCBR), which is conducting its Annual Workshop from 2nd to 7th January 2018. The Winter Course on Machine Intelligence and Brain Research is a 2-credit elective course for IIT Madras students. It offers rare insights into the fields of Neuroscience and Artificial Intelligence. It is currently being offered to 25 students selected on the basis of their exceptional academic performance and interests among a pool of 92 applications. The admission is expected to increase in the coming years. 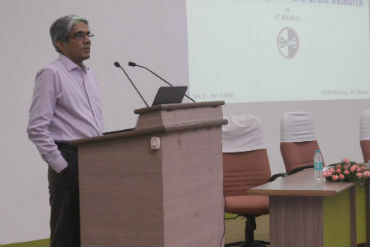 Speaking after inaugurating the workshop today (Tuesday, 2nd January 2018), Prof. Bhaskar Ramamurthi, Director, IIT Madras, said that the CCBR was expanding rapidly. “Like any research in Frontier areas, these expansions were occurring in directions that were not preconceived. We’re confident of having a large breakthrough in this Centre, which has faculty from several departments working with them”. “Fast progress in Machine Learning will help us better understand the Human Brain, which in turn will improve Machine Learning. It will lead to Machines that will have some intelligent capabilities,” added Prof. Bhaskar Ramamurthi. This year’s workshop consists of a broad spectrum of international lecturers, who are world renowned experts in the fields of artificial intelligence and neuroscience. CCBR’s chair professors, Prof Partha Mitra from Cold Spring Harbor Laboratory, USA; Prof Mriganka Sur from Massachusetts Institute of Technology, USA; and Prof Anand Raghunathan from Purdue University, USA, aim to impart their knowledge on the developing fields of artificial intelligence and the inner workings of the brain.